When it comes to refrigerators, we’re considering a couple of different options for our new log home. While researching things like “the best refrigerators”, “most energy-efficient refrigerators”, and “how to choose a refrigerator”… I’ve found lots of great tips for choosing a new refrigerator and increasing its energy efficiency at the same time. One thing I know for sure, we will definitely be buying a new refrigerator for our new home. 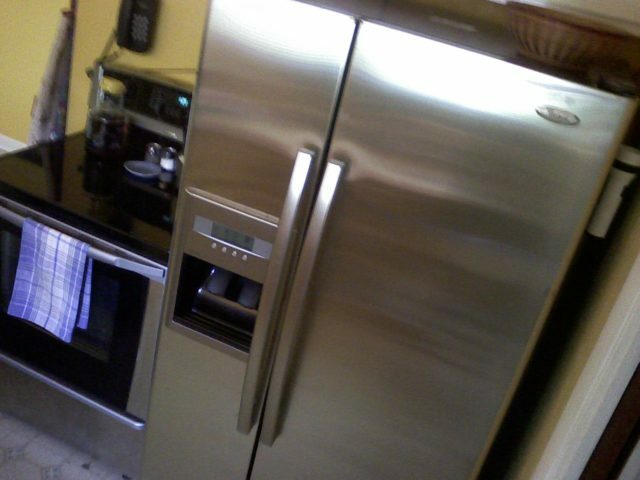 Our current side-by-side fridge/freezer isn’t nearly large enough (…and we don’t even cook much!). Plus, it’s white. Odds are, there’s not going to be a thing that’s white in our new log home — especially not in the kitchen. The only thing we really like about our current unit is the in-the-door water and ice dispenser. And now that we’ve had it for so many years, it would be hard to do without the convenience of a door-mounted ice and water dispenser like this. The biggest question I have at this point: What are the real differences between upright vs chest freezers? The only thing I know for sure is that uprights and side-by-side units use more energy than chests. If you choose a freestanding unit, then you’ll want to be sure to pick out your refrigerator (and/or freezer unit) before you install your kitchen cabinets. The size of your fridge will ultimately determine the width of the opening where your refrigerator will go, as well as the height of the space between the fridge and ceiling. Many people like to place a cabinet above the refrigerator, rather than lose it to “dead space”. Also, you should know that freestanding units can extend as much as 6 inches beyond the depth of your countertop & cabinets. Built-in, counter-depth units on the other hand tend to be shallower, with slightly less space inside, but they’re also less noticeable in your kitchen. As far as color goes… the most common refrigerator colors are white, black, stainless, or off-white (often referred to as biscuit or bisque). Thinking Of Using Your Old Refrigerator? Initially, we were thinking of taking our current refrigerator with us to the new house and using it in the basement. You see, our grill might be placed on the deck off the basement area, rather than the deck off the kitchen. (We grill a lot!) So it would be quite convenient to have a fridge nearby. And I’m sure we’d have no problem having twice as much storage capacity for cold foods and beverages any way …especially since we’ll be living out in the country, where a grocery store is many miles away. Ours is a 2001 model refrigerator. So, I’m thinking we’ll probably be taking it with us and using it as a secondary refrigerator. It’s got to be better than buying two whole new units, right? At least for a year or two. 1. Clean the condenser coils periodically. I just cleaned the coils on our fridge last week. Typically, you have to pop off the grill along the front bottom portion of the refrigerator to get to the coils. (It’s tricky to get back on, too.) Then, use a long-handled coil brush (or your vacuum’s crevice tool) to remove dust and debris from the area. For the record, they say that you should clean the coils at least once a year… even more often if you have pets. I hadn’t done it before, and this 6-year-old fridge had accumulated quite a collection of our 3 dogs’ fur! 2. Move food away from the refrigerator’s interior walls. This will permit cold air to circulate better. 3. Wipe the gaskets (weather stripping) around the doors occasionally. Use a damp rag. Otherwise, dust and grime can accumulate causing them to become brittle and less likely to seal properly. 4. Run your fridge and freezer at the optimal temperatures. Keep your fridge temperature between 37-40 degrees. Keep your freezer temp between 0 and 5 degrees.